Special Forces traces its lineage to the First Special Service Force (FSSF), constituted on July 5, 1942. A combined U.S. and Canadian unit, the FSSF was originally formed to conduct unconventional warfare in Nazi-occupied Norway. When that mission was canceled, the FSSF was repurposed for combat operations in the Aleutian Islands, Italy, and Southern France. It was officially disbanded on January 6, 1945 in Southern France. Although not in the official lineage, the experiences of other Special Operations elements contributed to the organization and doctrine of Special Forces. They include the Philippine guerrillas, elements of the Special Operations and Operational Groups Branches of the Office of Strategic Services (OSS), the Alamo Scouts, Merrill’s Marauders, the Korean War guerrilla command, and conventional airborne units. All of these units conducted operations in enemy-occupied territory or worked with resistance groups. In 1951, former Philippine guerrilla Lieutenant Colonel Russell W. Volckmann wrote Field Manual 31-21: Organization and Conduct of Guerilla Warfare. It set the doctrinal foundation for the first Special Forces unit, the 10th Special Forces Group, activated on June 11, 1952 under the Psychological Warfare Center , Fort Bragg, North Carolina. Under OSS veteran Colonel Aaron Bank, the 10th Special Forces Group (Airborne) deployed to Bad Tolz, Germany, September 1953. The remaining cadre at Fort Bragg formed the 77th Special Forces Group, which in May 1960 became today’s 7th Special Forces Group. The intervening years saw the number of Special Forces Groups rise and fall. Special Forces Soldiers first saw combat in 1953 as individuals deployed from 10th SFG (A) to Korea. These men worked with partisans under the Guerrilla Command late in the Korean War. In the late 1950s and early 1960s, teams of Special Forces Soldiers deployed to Laos to work with the Royal Laotian Army. In Vietnam, Special Forces Soldiers, initially, from 1st and 7th Groups, worked as advisors to the Vietnamese army and the Civilian Irregular Defense Forces. Later, 5th Special Forces Group took over this mission. Twenty one Special Forces Soldiers received the nation’s highest award for heroism, the Medal of Honor, for their service in Vietnam. The three decades following Vietnam witnessed Special Forces participation in virtually every campaign fought by the U.S. Army. In Grenada, Haiti, Panama and in the Balkans, Special Forces teams conducted unconventional warfare operations in support of the regular Army. In Operation Desert Storm, General Norman H. Schwarzkopf described the Special Forces as "the eyes and ears" of the conventional forces and the "glue that held the coalition together." In the post 9-11 Global War on Terrorism, Special Forces teams were instrumental in establishing the Northern Alliance coalition that ousted the Taliban government in Afghanistan in Operation Enduring Freedom and were critical to the success of the Coalition ground campaign in Iraq. In Operation Iraqi Freedom, Special Forces teams trained and fought with the Kurds in northern Iraq, cleared the western desert of Scud missiles and provided long-range special reconnaissance to the Coalition ground forces on the drive to Baghdad. The "Quiet Professionals," Special Forces units are today deployed worldwide displaying their dominance in full-spectrum operations through their unconventional warfare expertise. 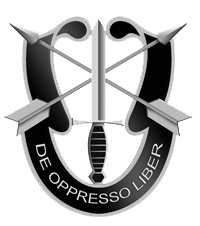 From humanitarian assistance and training of indigenous forces, to direct action and special reconnaissance missions, Special Forces Soldiers live up to the Special Forces motto: De Oppresso Liber, "To Free the Oppressed".